President Trump will not sign off on any deals related to immigration without the approval of pro-American immigration reformers Rep. Mark Meadows (R-NC) and Sen. Tom Cotton (R-AR). 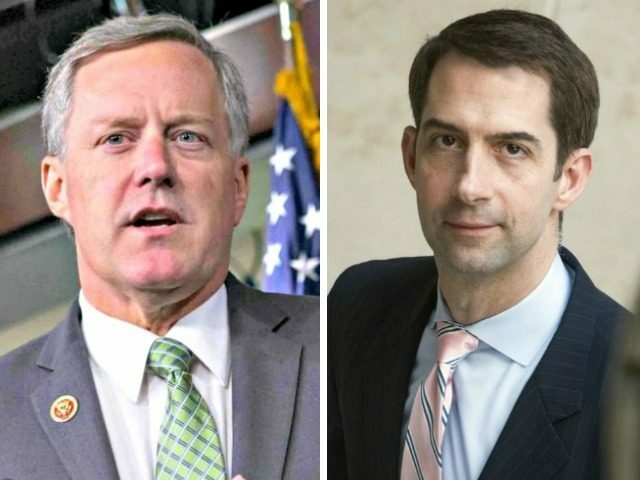 According to CNN reporter Dierdre Walsh, Meadows confirmed that Trump has entrusted himself and Cotton for their blessing of any immigration deals that are brokered between the president, Democrats, and the Republican establishment. Freedom Caucus Chair Mark Meadows told reporters President Trump committed to him that he wouldn't back an immigration bill unless he & Sen Tom Cotton backed it. Asked about Schumer saying Cotton can't be involved: "I don’t really care what Chuck Schumer says." Meadows and Cotton’s strong influence on national immigration policy is a win for Trump’s base and the populist, economic nationalist wing of the Republican Party, as the Congressman and Senator have vowed to only support a deal on immigration that cuts legal immigration levels to benefit American workers and constructs a wall along the U.S.-Mexico border. Mark Meadows and Tom Cotton. A SURE FIRE WAY TO LOSE what is left of GOP voters. The GOP deserves what it is going to get.